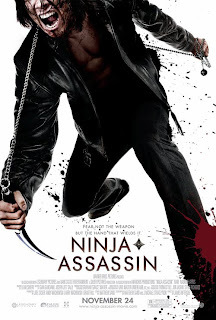 The Billionty-Oneth Geek: Ninja Assassin!!!!!!!!!!!!! Before this movie was released last fall, I had high hopes after I initially saw the trailers. It looked like good old fashion fun with fast action and NINJAS~! On top of that, it was directed by James McTeigue, who did V For Vendetta which I enjoyed. So uber violence, ninjas and McTeigue... how could it fail? Well, it was released in November and was universally panned by critics. I don't remember what specifically they said went wrong, but I do remember reading it's scores on RottenTomatoes and MetaCritic and the numbers spoke for themselves. It was enough to convince me that it wasn't worth the first-run cinematical viewing. Well, it came out on DVD this month and I did finally get to check it out. The opening scene kicks off with a bang. The movie starts off with a wise old man who tells of the myth behind the ninja, building him like a legend. He warns some local hoodlums that they are marked for death, but they ignore his cautions. And wouldn't you know it, a ninja shows up and literally cuts everyone down. It's probably the most over the top violent scene that I've seen in an American theatrically released movie. The violence is quite reminicent of the type found in a Takashi Miike movie like Ichi the Killer. Blood, gore and all the mushy inside body parts litter the screen. So when the opening scene concluded I thought to myself, "that was pretty good, how could it possibly go bad?". Well, the problem was that the movie continued. Even though the uber violence was a joy to see on screen, the poor plot just couldn't hold the whole thing together. I only watched the movie last week and already I'm having problems remembering the plot. Usually when I write a review, I'll look at its Wikipedia entry just to refresh myself on the plot. Well, I'm on Ninja Assassin's page right now and this is a first. There is no plot summary at all. You can almost always find the plot for even the most convoluted movies, yet there is none for Assassin. Strange, yet oddly understandable. If I can recall correctly, the story in some ways is kind of like Batman Begins. You have a young boy who is taken in by a ninja clan, trains him to be the most elite student, yet retains his morals in a heated situation which leads him to betraying his ninja clan. Years later, the clan comes after him with vengeance. There you have it, the plot to Ninja Assassin and part of Batman. I tried to simplify the contrived plot as much as I could so if it doesn't seem as loony as what you find in the movie, don't blame me. They do throw in a lot of convoluted elements that just make the whole thing ridiculous. The action is fun and slick on screen, don't get me wrong, but it's just all the parts in between that make it fall flat. It sort of reminds me of Gamer and even the Crank movies. Those two were both brainless and violent movies, yet the plot was kept simple making it easy to follow and enjoy. Had they used a simpler plot for Assassin, I think it would have been an easier pill to swallow. It's too bad too, they did work hard in piecing together the origin story so it leads me to think that they were hoping that this would have spawned a franchise. All that backstory for nothing. It's too bad for Rain, the Korean superstar and main star of this movie. Had this movie been a success, it would have made him a huge star stateside. This movie was no good, don't bother with it. If you desperately want to see ninja action, I'm sure you can find something better on store shelves. It's a gorefest but unfortunately, also a snorefest. Pass! Later geeks! I watched this at work one night on my friend's PSP. I agree with your total summary of the movie. It was pretty crappy save for the violent parts. That was dope! lol. I never seen Rain before, although Ive heard of him. Just to let you know on my off time while I am not working at the fire station, I will be training to become a NINJA!!! !